From Sherlock Holmes’ Baker Street and Jack the Ripper’s Whitechapel to the East End of the Krays and the white-collar crooks of the City, London has played silent witness to countless crimes both real and imagined. Moreover, in print and on screen the city has exported its criminal heritage to the world, becoming a global capital of wrongdoing rivalled only by New York and Los Angeles. Yet there has never been a guide to its darker points of interest – until now. 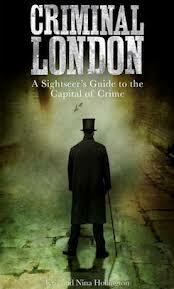 Traversing centuries of villainy, Criminal London explores the more scandalous moments of the city’s story. Featured herein are three original walks and over 100 sights to see, including: the scenes of infamous murders, watering holes frequented by notorious felons, the homes of great consulting detectives, and locations from London’s rich history of law and order, such as the Clink, Tyburn Tree and Bow Street Police Station. Perfect for adventurous tourists and curious Londoners, this is a sightseeing guide for the intrepid. It’s rare that I get sent or read anything that isn’t a work of fiction, but this was right up my (dark and sinister) alley. A perfectly formed and great size book which will be certain to accompany me on trips into the big smoke of London town from this day forth. Criminal London is a beautifully executed (no pun intended) volume, packed with great photography by Nina Hollington and text by her husband Kris. Sub-divided by areas of the capital with great easy to read maps and walking tour information, this is just the book you need if you want to follow in the bloodstained footsteps of Jack the Ripper or even read of the murder that took place in the antique shop that is now the favourite haunt of many a crime fiction fan, Goldsboro Books. Criminal London is one of those books that I’ll pick up time and time again, and will check every time I head off out to see which of the crime scenes I am about to step over. Slickly produced, well written and great photography throughout. Your only crime, as they say, would be to not get a copy – and it’s a steal!